mpaign: nyt2014_sharetools_mkt_topstories_478QW — 247890, creative: sharetools_mkt_nytnow_split_466WL — 369801, page: http://www.nytimes.com/yr/mo/day/business/media/eric-cantors-defeat-exposed-a-beltway-journalism-blind-spot.html, targetedPage: http://www.nytimes.com/yr/mo/day/business/media, position: MiddleLeftIt’s now clear why the primary defeat of the House majority leader, Eric Cantor, came so completely out of the blue last week: Beltway blindness that put a focus on fund-raising, power-brokering and partisan back-and-forth created a reality distortion field that obscured the will of the people. But that affliction was not Mr. Cantor’s alone; it is shared by the political press. Reporters and commentators might want to pause and wipe the egg off their faces before they go on camera to cluck-cluck about how Mr. Cantor, Republican of Virginia, missed signs of the insurgency that took him out. There was a lot of that going around, and the big miss by much of the political news media demonstrates that news organizations are no less a prisoner of Washington’s tunnel vision than the people who run for office. All politics is local, which may explain why The Richmond Times-Dispatch and The Chesterfield Observer both took David Brat’s Tea Party challenge to Mr. Cantor seriously, but few of the publications inside the District that follow the majority leader’s every wiggle and wobble sensed that he was leaving the home fires dangerously unattended. There are a number of dynamics — political, cultural and economic — at work. Congressional races are a mess to cover because there are so many of them, and this year, the House of Representatives is not in play while the Senate most definitely is. The math of covering someone who may become one of only 100 senators is far easier. The same forces that keep politicians penned up within a few blocks of Pennsylvania Avenue work on journalists as well. No one wants to stray from the white-hot center of power for fear of being stuck in some forsaken locale when something big happens in Washington — which is why it has become one of the most overcovered places on earth. That Beltway provincialism is now multiplied by the diminution of nonnational newspapers. The industry as a whole is about half as big as it was in 2007, with regional newspapers suffering acute cutbacks. In just the last year, five reporters with decades of experience have left the Richmond statehouse. Plenty of reporters are imprisoned in cubes in Washington, but stretched news organizations aren’t eager to spend money on planes, rental cars and hotel rooms so that employees can bring back reports from the hustings. While the Internet has been a boon to modern reporting — All Known Thought One Click Away — it tends to pin journalists at their desks. I was on a panel with Gay Talese some time ago, and he said, “We are outside people,” meaning that we are supposed to leave our offices and hit the streets. But the always-on data stream is hypnotic, giving us the illusion of omniscience. Data-driven news sites are all the rage, but what happens when newspapers no longer have the money to commission comprehensive, legitimate polls? The quants took a beating on this one, partly because journalists are left to read the same partisan surveys and spotty local reporting as Mr. Cantor’s campaign staff, whose own polling had him up by more than 30 points. Hordes of blogs and news sites continue to chase the latest incremental scoop that will draw followers on Twitter, but a whole other channel of information is out there, including talk radio. Politico called it “Brat’s secret weapon,” to which, we might ask, secret to whom? About 50 million people in America listen to talk radio, much of it from conservative commentators like Mark Levin, Glenn Beck and Laura Ingraham. They may represent a significant slice of Vox Populi, but they aren’t on heavy rotation in most newsrooms. Conservative talk radio blows a whistle that many journalists either can’t hear or don’t want to listen to. The same goes for Breitbart.com, which sent a reporter to Mr. Cantor’s district. 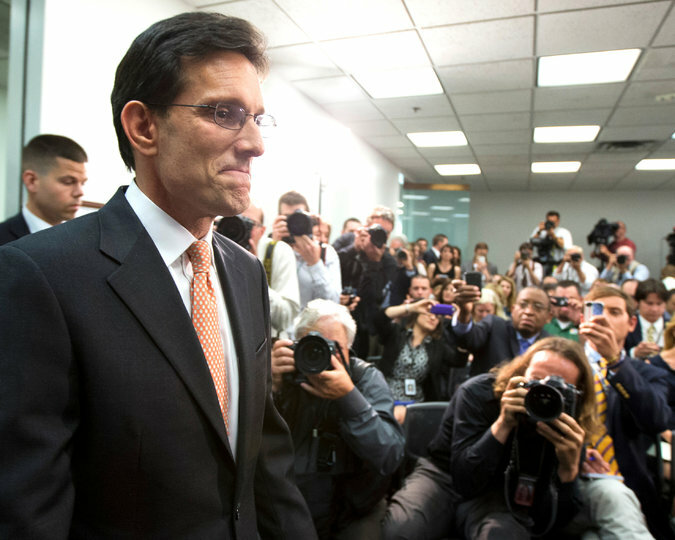 He stayed there because he noticed something the polls did not — that Mr. Cantor was seldom seen during the race. Mr. Brat gave an interview to Mr. Beck. Mr. Levin got on the Brat bus early and stayed there, and Ms. Ingraham went to his district and spoke on his behalf at a well-attended event. At some point, Mr. Cantor and his staff must have realized that the race was not the cakewalk they thought it was, and they put out silly attack ads suggesting Mr. Brat was some kind of closet liberal. The voters who pushed him past Mr. Cantor by a margin of 11 points knew better, suggesting that paid news media will never trump the unpaid sparkle that Ms. Ingraham and her conservative cohort conveyed. Even a cynical power broker like Frank Underwood on “House of Cards” — also part of the House leadership — knew that if you don’t pay fealty to the voters who elected you, all the trappings of leadership can disappear at the whim of the people. Mr. McConnell says he is grateful to have been covering Mr. Brat in the first place. In 2009, he was laid off from his job covering sports in Fredericksburg, Va., and was out of work for 18 months.